Brigid Quinn’s experiences hunting sexual predators for the FBI have left her with memories she wishes she didn’t have and lethal skills she hopes never to need again. Having been pushed into early retirement by events she thinks she’s put firmly behind her, Brigid keeps telling herself she’s settling down nicely in Tucson with a wonderful new husband, Carlo, and their dogs. But the past intervenes when a man named Floyd Lynch confesses to the worst unsolved crime of Brigid’s career—the disappearance and presumed murder of her young protege, Jessica. Floyd knows things about that terrible night that were never made public, and he offers to lead the cops to Jessica’s body in return for a plea bargain. This should finally be the end of a dark chapter in Brigid’s life, except the new FBI agent on the case, Laura Coleman, thinks the confession is fake, and Brigid finds she cannot walk away from violence and retribution after all, no matter what the cost. Rage Against the Dying is a heart-pounding thriller that grabbed me from the first chapter and did not let go. It’s got everything: memorable characters, plot twists and excitement. It’s Becky Masterman’s debut thriller novel and I can’t wait to read her next one. I’m hooked on Brigid Quinn! Brigid Quinn is not your typical protagonist. She’s a 59 year old retired FBI agent who spends her days with her beloved pugs and new husband, Carlo. She enjoys rock collecting and keeps herself physically fit. She has demons in her past including an unsolved serial killer case (Route 66 Killer) that has haunted her for years. Her young FBI protegé was the killer’s last victim and Brigid feels partly responsible. She’s called back on the case to consult after a man named Floyd Lynch confesses to the string of murders. Floyd knows details about the case that were never released to the public which at first look makes him seem like “the one”. However, Brigid notices some descrepancies with his confession. She’s not the only one who has her doubts. FBI agent, Laura Coleman, also believes Floyd has a false confession and wants Brigid’s help to prove it. What I liked about this book is that I didn’t know what was going to happen. There were a few plot twists that caught me off guard and were very intense. Let’s just say there were many late nights because I found Rage Against the Dying so hard to put down. Brigid is one tough cookie and I really felt connected to her character. She speaks her mind and is strong and composed under pressure. I really admired how she handled all the tense situations she found herself in. She is a refreshing change from the typical heroine of thriller novels. 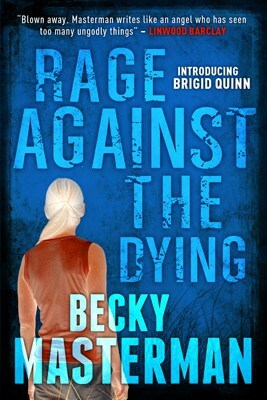 I really hope Becky Masterman continues on with this series so I can immerse myself back in the world of Brigid Quinn! Check out this clip from the Audiobook! gotta love girls who speak their minds! This book is definitely going into my must read list. It sounds amazing. Love mysteries and drama and this has all the things I enjoy in a book. When I first read the title I wasn’t sure, but your review is excellent. My heart is pounding already in anticipation. My daughter would also like this. She is very into Kay Hooper’s paranormal FBI series, and we both read true crime stories that gives us both chills. I didn’t know this author specifically but will have to check it out. Hello, Stacie. This book sounds great. At this rate, your reviews may have me needing to buy a new bookshelf. This is a great sounding book!! I love a good thriller and this is definitely going on my TBR list 🙂 Thanks for your review!! very cool sounding book. Thanks for the great review. I really like to read suspense and drama/mystery novels, so this book is right up my alley. Thanks for the honest review. I have confidence that the book is good, when you say you want to read more of the author’s novels. I really want to read this book. It’s my next book purchase! This sounds like a book I would just love! Ty for the review!